Let’s get one thing straight: plain, gray concrete is best used in military bunkers. Other than that, it’s downright boring. What can you do to spice up the gloom into glam? There’s one solution: stain it. If you’re a parent, the word “stain” probably doesn’t make you think of a beautiful, antique floor. Nonetheless, staining is a great way to turn a slab of gray into luxurious floor that looks like it predates the Civil War. Staining is a great way to turn a slab of gray into luxurious tones of brown, green, even blue. Concrete experts generally use one of two ways to stain concrete: acid and water-based stains. Each one has a specific purpose, but which one should you use? Staining concrete takes time and effort, but the results can be beautiful. Acid stains are made up of metallic salt minerals dissolved into a water-acid mixture. The acids allow for a chemical reaction during the curing process that permanently changes the surface of the concrete in color and texture. Acid stained porch in Colorado. Image taken from www.denverconcretecompany.net. Non-acid stains treat concrete differently than an acid stain. Instead of altering the structure of the concrete, non-acid stains create a layer over the concrete surface, filling pores and leaving behind a flat, smooth finish. Non-acid stained concrete. Image taken from www.super-krete.com. In order to stain concrete, the concrete must be cured to its proper strength. This can take up to 48 hours (which feels more like forever than it actually is), but with concrete curing products this time can be nearly cut in half. Powerblanket’s Concrete Curing Blanket helps keep concrete at stable temperatures above 50°F, making cure time 2.8 times faster than open air curing. This is especially helpful when staining concrete in places where temperatures are variable or close to freezing. Make sure your concrete creation cures correctly. Once the concrete is cured, you can move on to the staining process. Begin washing down the concrete surface. You won’t want any food crumbs or shoe scuff marks to get in the way of the stain, so make sure to give it a good scrub down. Also remove any layers of glue, sealers or curing membranes that might prevent the stain from contacting the concrete. Finally, apply a concrete acid cleanser to the project surface to ensure the concrete is as porous as possible. Once it has dried, rinse the concrete with water. The time has arrived to forever change the way your concrete looks. After the concrete is no longer wet from rinsing, use a brush to spread the stain across the project surface. If it’s a puddle you can splash in (don’t), it’s too thick. If it disappears right after applying it (i.e. it absorbed into the concrete), you need more. Image taken from www.lovelyimperfection.com, a concrete DIY blog. Once your initial layer is down, allow 24 hours of drying before doing another layer of stain, even if it’s the same color of stain. Most stains have difficulty drying in cold temperatures. If you can’t help but do a concrete staining project in the dead of winter, a Concrete Curing Blanket can save the day, allowing the stain to dry within a controlled environment. You’re so close to being done! After the stain has dried, use a sealer or wax to protect the stain from dirt or grime that could change the color or texture over time. You’ll need to regularly clean the project surface, but don’t use powerful chemicals like bleach, vinegar or ammonia. Such solutions can damage stained concrete. And you wouldn’t want that, would you? Finally, bask in your work. Enjoy the fruit of your labors by eating a large bowl of grapes on your newly stained concrete patio, kitchen counter, table top, or garage floor. Cannabidiol (CBD) is one of 113 known cannabinoids found in cannabis plants. While CBD as we know it has been around for over 70 years, it has recently skyrocketed in attention and popularity. Unlike THC (another cannabinoid found in cannabis plants), CBD does not cause an altered mental state and may even have huge potential for medical applications. While limited research has been done on CBD, many are hopeful that as research progresses, CBD will become a more readily-available treatment option for issues like epilepsy, pain management, anxiety, depression, and even cancer. A cannabinoid is a chemical compound that acts on cannabinoid receptors in cells and alter a neurotransmitter release in the brain. Cannabinoids fall under two categories: endocannabinoids and phytocannabinoids. Endocannabinoids are produced naturally in our bodies and are believed to help regulate important neurological functions. The endocannabinoid system has only recently been recognized for its importance and relatively little is known about it. Phytocannabinoids occur naturally in plants. Limited research indicates that phytocannabinoids could help resolve issues that come from endocannabinoid imbalances. Phytocannabinoids are extracted from cannabis plants (marijuana and hemp). The predominate cannabinoids found in cannabis plants are THC and CBD. Often, the terms “cannabis”, “marijuana”, and “hemp”, are used interchangeably. It is, however, important to understand the differences between the three. “Cannabis” is the family classification that marijuana and hemp fall under. While marijuana and hemp share some similarities, there are some crucial differences between the two. Most notably, while marijuana strains are typically between 15 and 40% Tetrahydrocannabinol (THC), hemp is less than 0.3% THC. The bulk of hemp’s composition is CBD, accounting for approximately 40% of the plant’s extract. THC and CBD are the predominant cannabinoids found in cannabis plants. Put simply, THC gets you “high,” while CBD is thought to provide more medical applications. THC is the most potent psychotic found in cannabis plants. As mentioned above, it’s found in higher percentages in marijuana. Besides giving you a “high,” THC can cause feelings of lethargy and dysphoria and may even make anxiety and seizures worse. CBD does not have intoxicating effects like THC. CBD oil is often used to treat epilepsy and pain. Some claim that CBD relives sleep issues, depression, anxiety, and other mental health disorders. It may even counteract the psychoactive effects of THC. CBD usage has been linked with side effects like decreased appetite, fatigue, weakness and sleeping problems. 1940: CBD was first extracted by chemist Roger Adams. It wasn’t until a few years later, however, that Roger Adams realized he may have stumbled upon something useful and began performing further research on the substance. 1946: Dr. Walter S. Loewe conducted tests that supported the theory that CBD didn’t cause an altered mental state. 1946: Dr. Raphael Mechoulam documented CBD’s three-dimensional structure. Mechoulan is often credited as the scientist who discovered CBD. 1980: Dr. Raphael Mechoulam conducted research that supported the theory that CBD could treat epilepsy. 2013: Charlotte Figi, a girl who suffered from chronic seizures, all but eliminated her seizures using high-CBD strain cannabis; her story gained national attention. 2017: the FDA advisory panel approved the CBD medication Epidiolex to treat two forms of childhood epilepsy. Some experts say that evidence for CBD’s benefits is scant. Most claimed benefits of CBD have only been evaluated by one or two human studies and most studies do not compare results to a control group. Some researchers argue that any beneficial effects could simply be a placebo. Furthermore, it’s unclear which specific biochemical interactions are affected by CBD. This scant evidence, however, is not necessarily because CBD is ineffective; there simply hasn’t been enough reputable research conducted. Many are confident that continued CBD research will confirm the widespread claims of its medicinal potential. Epilepsy- Epilepsy is the only condition with significant scientific evidence that supports CBD as a viable treatment option. Three separate clinical trials have indicated that pharmaceutical-grade CBD reduces seizures with minimal side effects. The CBD-based medication Epidiolex is currently used to treat two rare forms of epilepsy: Lennox-Gastaut syndrome and Dravet syndrome. Pain/Inflammation- While there hasn’t been enough human trials to confirm CBD’s effect on pain and inflammation, animal trials indicate it could be a successful treatment. Some research has found that CBD reduced levels of chronic inflammation in rats and mice. Anxiety- Some human clinical trials suggest that CBD could be an effective treatment for anxiety disorders including generalized anxiety disorder, panic disorder, social anxiety disorder, obsessive–compulsive disorder, and post-traumatic stress disorder. Cancer- An article published in the British Journal of Clinical Pharmacology that CBD can prevent cancer cells from spreading. While more research is needed to further support this claim, CBD’s anti-cancer properties are currently being researched throughout the United States. While CBD is legal across the US, states have varying limitations on its use. Where limitations exist, the most important factor in determining legality is whether the CBD is extracted from hemp or marijuana. Even though CBD is legal, lack of regulation can make it difficult and sometimes unsafe to use. Besides Epidiolex, a CBD epilepsy medication, no forms of cannabis are recognized by the FDA. This means that CBD supplements and products are produced without regulation. CBD users must take care to purchase CBD from a reputable distributor; labels may not have the correct information about actual CBD content. The goal of CBD extraction is to generate a high-concentrate CBD product for potential beneficial use. The CO2 Extraction method uses pressurized carbon dioxide to pull phytochemicals from cannabis plants. While this method is extremely effective in producing high-quality CBD oil, it requires expensive machinery and the hand of an experienced chemist. The supercritical CO2 passes through cannabis trimmings in an extraction chamber where it dissolves and collects extracts from the plants. The CO2 / extract solution then enters a lower-pressure separator chamber. The lower pressure causes the CO2 and plant extracts to separate. The CO2 returns to the CO2 chamber and the cannabis oil is drained from the separator. This simple extraction method works by using ethanol as a solvent to remove extracts from cannabis plant trimmings. While fairly easy, this method can be dangerous (ethanol is extremely flammable) and potentially damage or create harmful toxins within the cannabis extract. First, ethanol is added to trimmings and mixed for a couple of minutes to allow the ethanol to dissolve extracts from the plant materials. Next, the ethanol is strained from the trimmings. Finally, the ethanol/extract mixture is slowly heated until all ethanol evaporates and only the plant extracts remain. Ice water extraction creates a powdery resin extract often referred to as “hash” or “bubble hash.” This is another fairly easy extraction method that can produce high yields if done correctly. As with other methods, if done poorly, it will produce low-quality product. First, finely-chopped plant trimmings are mixed with either ice or dry ice. This step is supposed to help separate extracts from the plant material. Next, water is added to the ice and trimmings and the entire mixture is strained through a mesh bag. The extracts will settle to the bottom of the strained water. Often, the mixture is strained multiple times through progressively smaller-micron mesh bags until the purest-possible extracts are obtained. Finally, excess water is drained from the strained mixture and the extracts are left to dry. Unlike previously mentioned methods, this technique results in cannabis-infused oil, not pure cannabis extract. It’s a popular option for at-home extraction because it’s safe, simple, and inexpensive. Olive oil extraction, however, produces very low yields of cannabis oil. Essentially, cannabis plants are placed in olive oil (or any other cooking oil) and warmed for 1-2 hours. Next, the infused oil is strained from the plant trimmings. No matter which extraction method is used, careful temperature is control is an important element of high-quality yield. Extreme temperatures can denature CBD. Additionally, some processes require very specific temperatures; if certain steps are not performed at correct temperatures, the extraction process could fail completely. Powerblanket offers a wide range of temperature control solutions that could be the perfect addition to your CBD extraction set-up. Our products are easy to install and remove and won’t disrupt your current process. If you’d like more information, you can give us a call at 888.316.6324. Do you know any interesting facts about CBD we didn’t include in this article? Let us know in the comments! Cannabidiol (CBD), a cannabinoid found in cannabis plants, is becoming more and more popular as an alternative solution to common ailments. Unlike Tetrahydrocannabinol (THC), another cannabinoid found in cannabis plants, CBD does not have psychoactive effects. When CBD oil is ingested, however, only 20% of it is absorbed. This means that for CBD to be effective, the CBD extraction process must be carried out carefully. The CO2 Extraction method uses supercritical carbon dioxide to pull phytochemicals from cannabis plants. Supercritical materials are not quite a liquid but not quite a gas and possess the properties of both. This state is ideal for plant extraction because supercritical CO2 can move through materials like gas and dissolve materials like a liquid. The CO2 is prepared in a compression chamber. First, CO2 gas is turned into a liquid; this is done by dropping the temperature to under -69°F and increasing the pressure to over 75 psi. Next, the the temperature and pressure are both raised until the liquid becomes supercritical. The supercritical CO2 passes through cannabis trimmings in an extraction chamber where it dissolves and collects extracts from the plants. The CO2 / extract solution then enters a lower-pressure separator chamber. The lower pressure causes the CO2 and plant extracts to separate. The CO2 returns to the CO2 chamber and the cannabis oil is drained from the separator. Ethanol is added to trimmings and mixed for a couple of minutes to allow the ethanol to dissolve extracts from the plant materials. The ethanol is strained from the trimmings. The ethanol/extract mixture is slowly heated until all ethanol evaporates and only the plant extracts remain. Inexpensive- This method doesn’t require any fancy machinery. Simple- This method is pretty straightforward and can even be done at home. Dangerous- Ethanol is extremely flammable. Could Damage CBD- Ethanol could potentially denature the CBD if overheated or overmixed. Finely-chopped plant trimmings are mixed with either ice or dry ice. This step is supposed to help separate extracts from the plant material. The extracts settle at the bottom of the strained mixture. The excess water is drained from the top and the extracts are left to dry until they become powdery. Inexpensive- Again, no fancy machinery needed! High Yield- If done correctly, this method produces a relatively large amount of plant extract. Not always practical- This method can be labor intensive and time consuming. Cannabis plant trimmings are placed in olive oil (or any other cooking oil) and warmed for 1-2 hours. The infused oil is strained from the plant trimmings. Easy- This is by far the easiest extraction method and is a popular home option. Low Yields- This method produces low yields of heavily diluted CBD. Regardless of the method used, careful temperature is control is an important element of high-quality yield in CBD extraction. Extreme temperatures damage CBD. Additionally, many processes need specific temperatures to have success; if ideal temperatures are not maintained, the extraction process could completely flop. Powerblanket offers the best of the best when it comes to total temperature control. Our products are easy to install and remove and won’t disrupt your current process. Additionally, our products are made to order and can be customized to fit your specific needs. If you’d like more information, you can give us a call at 888.316.6324. Do you have a favorite CBD extraction method we forgot to mention? Let us know in the comments! When you think of molasses and honey, you probably think of Memaw’s cookies over clogged pipes and industrial concrete blankets. Well, welcome to Powerblanket, where new applications for our electric blankies pop up like daisies. Customers including…bakeries? There is a long list of common baking ingredients that congeal, harden, thicken, freeze, or crystallize as temperatures drop. Coming from a perspective of manufacturers, packaging, and shipping, this can be a problem. They need heat to keep them liquid and transportable. Check out some of the melting points of common baking ingredients. Runny Honey: What is Honey Made of? Honey is made of different complex and simple sugars, water, vitamins, antioxidants, enzymes, and minerals. These different parts lead it to eventually crystallize, which is an issue in bulk. To help you visualize, imagine having a 55 gallon barrel full of honey you have to bottle and ship out. If that entire honey drum has crystallized due to cold weather, are you going to scoop it out with a spoon and hand-squish it into every bottle? That would be both sticky and inefficient. The same goes for other products that harden or thicken and aren’t liquid enough to be poured or pumped. Honey becomes almost impossible to spread or work with when it crystallizes (you’re probably familiar with the ole’ “pop the honey in the microwave” trick). When honey is crystallized, it’s melting point ranges between 104 and 122 °F (40 and 50 °C). This range accounts for the fact that the chemical makeup of honey will vary due to differences in bees, impurities, climate, flower supply, and geographical location of the particular hive. Honey must undergo extremely minimal straining to be considered “raw” by the FDA. This indicates how important it is to heat honey with great care. Processed honey on the other hand, is blasted by high heat (161 ºF and higher! ), straining, and pasteurization, which process destroys helpful yeast cells, enzymes, and antioxidants in raw honey. Overheating honey destroys the properties of honey that are most nutritional for our bodies. Around 200 components, including antibacterial properties, are lost if honey is heated over 98.6 ºF (37 ºC). Higher than 104 ºF (40 ºC) and valuable enzymes are destroyed. In short, the danger of just sticking honey in a manufacturing microwave is denaturing, devaluing, and scorching it. Heating solutions for crystallized honey include generic electric heating blankets. However, these run the risk of scorching the honey, or overheating it. Because of this, it is crucial to heat and decrystallize raw honey carefully. If you heat honey above 104 ºF (40 ºC), it will caramelize. For those apiarists and manufacturers that want to preserve their raw honey and still be able to bottle it, they need a specialized solution. The BeeBlanket has been engineered to the temperature of a beehive, which preserves the valuable raw aspects of the honey, while warming it enough to liquify it. Coconut Oil is used for a huge variety of purposes, not just for food. Depending on the makeup of your specific coconut oil, it melts at a temperature between 76-78 ºF (24-25 ºC). The melting point depends on how pure the oil is. Impurities spark crystallization. The purer the oil, the lower the melting point. Overall, at average room temperature and below, coconut oil is solid. Since coconut oil applications range from hair products to treating eczema, it is important that manufacturers package their coconut oil properly and accurately in a liquid state. Luckily, heating coconut oil back into liquid doesn’t affect the oil’s quality at all. The biggest issue is heating it slowly and evenly, so it doesn’t scorch. Memaw and I appreciate molasses for its sweet, smoky flavor. Molasses is usually made from boiled down sugar cane, and can also be made from sugar beet juice, dates, pomegranate, and sorghum. It will crystallize due to lowered temperatures or condensation. Molasses doesn’t freeze in any industrial grade freezer due to the sugar acting as an antifreeze to the water molecules. The water will evaporate out, leaving crystallized, grainy molasses. The key is to keep it at normal temperatures with light heat. Molasses is made primarily from sucrose, depending on the source: sugarcane, sugar beets, and sorghum are all sources from which molasses is made. The more sucrose, the more likely crystallization will occur. Slow, even heat will solve any crystallization problems. After fixing any problems with heat, molasses crystallization is less likely to happen again by adding citric acid or pure fructose. Believe it or not, oil congeals as it gets colder as well. The melting point of vegetable oil varies greatly depending on the type: sunflower oil and safflower oil (2 ºF, -17 ºC), canola oil (14 ºF, -10 ºC), olive oil and sesame oil (21 ºF, -6 ºC), peanut oil (37 ºF, 3 ºC) are just a few. One company we work with ships vegetable oil overseas. They said, “in the winter, the oil congeals to a white residue because of the cold temperatures onboard the ship.” Like most problems with heating, they needed a solutions that would “heat the totes gently to get the oil back to its original consistency…” Keyword being gently. Uniform heat is important for warming oils just like other food products as to not scorch them or damage their chemical makeup. Shortening is solidified, hydrogenated vegetable oil. When it comes to shortening (think Crisco), customers we’ve worked with are more concerned with softening it than melting it. With a melting point of 117º F, it is almost always in its solid, fluffy form. However, semi-vehicles will ship the product in cold weather, where it will freeze and become rock hard. In order to get it ready to sell, it needs to be warmed with a slow, uniform heat to about room temperature (68-72 ºF). Even though all of the products we’ve mentioned are different in composition and chemical makeup, they have something in common: food! To finally get to our table, it is important that manufacturers are able to transport them, and that means finding proper temperature solutions. Lindberg, Barbara. “The Bee Journal.” Why Does Honey Crystallize? January 01, 1970. Accessed November 19, 2018. http://thebeejournal.blogspot.com/2011/12/heating-and-freezing-honey.html. The difference between raw honey and pure honey is lost on many. Runny honey? Rock hard? “Who cares! Just pop it in the microwave!” Well, hypothetical person, honey is actually more complex than that. Honey is made of delicate sugars, water, vitamins, antioxidants, enzymes, and minerals that can be damaged when overheated. Let’s take a proverbial “Magic School Bus” dive into the honey pail. It’s time to educate yourself on the chemistry of this ancient ambrosia, how to keep it from pasteurization, and why. So why do bees make honey in the first place? Turns out we’re not the only ones who like honey on our toast. Bees eat honey and save it to live on during the winter. Forager bees collect nectar from flowering plants and take it back to the hive in their honey stomach (also known as honey crop), and transfer it over to house bees. Then, over a 20-minute period they will process the nectar in their crop, absorbing the water and breaking down the larger sucrose sugar molecules into smaller glucose and fructose sugars. No, honey isn’t “bee vomit,” or “bee-barf” as my coworker likes to call it. This is because regurgitation is voluntary, and never passes through the bees central digestive system. After regurgitation, the bees will then deposit the nectar-turned-honey into honeycomb, and will fan it with their wings. This helps to further dehydrate the honey, which gives it preservative qualities. The low water content in honey, below 20%, also makes it uninhabitable for bacteria. This low water content and acidic properties gives honey antiseptic qualities too, good for topical use and health treatments, like for a common sore throat. Honey is made of different sugars, water, vitamins, antioxidants, enzymes, and minerals. Raw honey comes straight from the hive, after an apiarist lightly filters it by hand to remove any debris. This preserves the nutritional qualities of the honey. Processed honey is heated at 70 degrees Celsius and then rapidly cooled, killing and destroying beneficial bacteria, enzymes, pollen, antioxidants, vitamins, and minerals. This, and intense straining “purify” the honey and is done mostly for aesthetic reasons. All in all, processed honey is significantly less beneficial for your body just so it will look pretty on the shelf. When apiarists and beekeepers remove honey from the hive, they usually keep it in pails. Hive temperatures average between 89º to 95º Fahrenheit. If the weather is cold enough, depending on the type of honey, it will begin to crystallize. A honey bucket heater or honey drum heater is a great solution to decrystallize raw honey without heating it enough to pasteurize it and helping preserve its nutritional value. Check out this infographic for more information on what honey is made of! Charlotte, Beekeeper, Pete Jones, and Beekeeper Charlotte. “What Do Honeybees Do With Pollen?” Carolina Honeybees. October 15, 2018. Accessed November 13, 2018. https://carolinahoneybees.com/why-pollen-is-vital-for-honeybee-survival/. Common Disease Problems. Accessed November 13, 2018. https://www.uaex.edu/farm-ranch/special-programs/beekeeping/about-honey-bees.aspx. “Honey, Recipes, Research, Information.” National Honey Board. Accessed November 13, 2018. https://www.honey.com/faq. DEF is a key factor in making sure our trucks run smooth, efficient and clean on America’s highways. This liquid is used in nearly all diesel-fueled vehicles in the United States, from pickup trucks to ambulances to 18-wheelers. With something so commonplace, you’d think that most people have heard of DEF. But that’s not the case. Do you know what DEF is? Join Powerblanket as we explore DEF in why it’s important, how it’s used, and what to look out for so you use it correctly. DEF is most often seen as a clear, odorless liquid. When it dries, it solidifies into white crystals. DEF is a critical part of the exhaust system in diesel engines. The Environmental Protection Agency has been limiting nitrogen oxide emissions since 1994, with additional reductions in 1998, 2002, 2007, and 2010. According to the web-based science, research, and technology news service www.phys.org, “Nitrogen oxides (NOx) are poisonous gases derived from nitrogen and oxygen combustion under high pressure and temperatures…[it] can cause breathing problems, headaches, chronically reduced lung function, eye irritation, loss of appetite and corroded teeth. Indirectly, it can affect humans by damaging the ecosystems they rely on in water and on land—harming animals and plants. In Britain alone, known NO2 emissions have been estimated to kill 23,500 people every year, according to aerosol science professor Ian Colbeck of the University of Essex, southeastern England.” The World Health Organization classified NOx as being a cause of cancer in 2012. Before the 1990s, exhaust systems were not regulated. Beginning in 1994, diesel regulations limited the amount of NOx pollution released by diesel-fueled vehicles. Since then, DEF has become a staple in virtually all diesel trucks on American roads in their Selective Catalytic Reduction (SCR) system, where exhaust is treated in the exhaust system instead of the engine itself. As the exhaust leaves the engine, a mist of DEF is sprayed into the exhaust. The two mixes into ammonia and NOx, which then goes through the SCR catalyst, which changes both into nitrogen and water vapor. This final result is harmless. Nearly all diesel-fueled vehicles in the United States use DEF. This includes ambulances, fire trucks, and wildland firefighting engines. Powerblanket met with the Madison Fire Department in Rexburg, Idaho, to discuss the uses of DEF within its firefighting fleet. In Rexburg, winters can drop outdoor temperatures well below -20°F. In order to make sure the temperature doesn’t affect DEF quality, all Madison Fire Department vehicles are equipped with internal heating devices to ensure DEF does not freeze. Several vehicles, such as the ambulances and pickup trucks, have internal DEF tanks equipped with heaters. Standard fire engines and wild land fire engines, on the other hand, use external DEF tanks. The nearest DEF pump station is located 30 miles away, so fire crews have to purchase DEF locally in 2.5 gallon containers to fill both internal and external DEF tanks. The U.S. Military also has a large vehicle fleet that consumes diesel fuel. However, DEF is not commonly used in bases across the world. With the exception of vehicles used for local travel, heavy-duty vehicles such as tanks and work trucks are exempt of NOx reduction regulations. This is due in large part for lack of high quality, low sulfur diesel fuel in places such as Iraq and Afghanistan, whereas jet fuel, that has a high sulfur content that would quickly clog filters that use DEF, is plentiful. In the U.S. Military, being able to take a tank brigade and armored truck division out of Louisiana and send them into combat zones across the world is paramount. Using jet fuel, which negates the need for DEF, is essential to that mission. As federal government regulations increase the demand for quick access to DEF, gas stations are rising to meet that need, particularly those that cater to long-haul truckers. DEF refilling pumps can be most often seen next to diesel fuel pumps. Such pumps are clearly labeled with “DEF” on them, and most DEF tanks are fitted to not allow diesel fuel to be accidentally pumped in. Running out of DEF: When your vehicle is low on DEF, a warning light will come on to alert the driver that if the DEF tank is not filled soon, the vehicle’s performance will undergo a sudden change. When the DEF tank is completely empty, the vehicle will slow to a maximum speed of a mere five miles per hour. This is so the vehicle is preserved until the DEF is refilled. Once the DEF tank has been replenished, vehicle performance will resume as usual. DEF expires: DEF has a very short shelf life. In fact, purchasing DEF that has been sitting on the shelf for more than a year and pouring it into your exhaust system will cause damage to the vehicle. If stored away from sunlight and between 10°F and 90°F, DEF’s shelf life can last up to a year. How do you know if your DEF is expired? All DEF containers that are purchased at automotive supply shops have an expiration date on the package, not too dissimilar from food expiration dates. DEF pumps at gas stations do not have a labeled expiration date due to the constant cycling of DEF into the pump. Never mix: Though DEF itself is also harmless–spills can be simply wiped up with a rag–it should never be poured into the fuel system. In addition, other liquids, such as additives, should never be added to the DEF tank. Some people think that because DEF is made up partly of urea, it’s acceptable to urinate into their DEF tank when they’re low on DEF. This is not true. DEF uses a synthetic urea not derived from biological sources, and is made to have a highly purified solution of urea. Agricultural urea fertilizers should also never be poured into a DEF tank. Keep it heated: DEF freezing in your truck will not damage the SCR system. Operating a vehicle with frozen DEF is fine, but less effective than if it was thawed. Many vehicles use internal heating equipment or the engine heat itself to keep DEF thawed enough to use. However, if DEF is stored in bulk in an external tank, a heating source will be required, such as a hot box. Keeping DEF at a regular temperature between 10°F and 90°F is critical to ensure quality DEF. DEF is an important part of diesel-fueled vehicles. Though not part of the drive system, DEF is essential to making the world a better place by lowering vehicle exhaust and smog. It’s a key part of the trucking industry, and will continue to be as the EPA’s NOx regulations are in place. Viscosity is the measure of a material’s resistance to motion under an applied force. There are several formulas and equations for viscosity calculation. If youwant a simple science experiment, measure the speed of a metal ball dropped in a container of liquid. The velocity of the ball, combined with the relative densities of the ball and the liquid, can be used to calculate the viscosity of liquids. Measure the mass of your ball, using your balance. For instance, suppose the mass of the ball is 0.1 kilograms (kg). Find the radius of the ball by first measuring the diameter (distance of a straight line through the ball at the widest part). Divide the diameter by 2; this gives the radius of your ball. Measure the mass of your graduated cylinder when it is empty. Then measure the mass of your graduated cylinder with 100 millilters (mL) of liquid in it. Suppose the empty cylinder had a mass of 0.2 kg, and with fluid its mass was 0.45 kg. Fill your tall graduated cylinder with the liquid to be tested so it is about 2 cm from the top of the cylinder. Use your marker to make a mark 2 cm below the surface of the liquid. Mark another line 2 cm from the bottom of the cylinder. Measure the distance between the two marks on the graduated cylinder. Suppose that the distance is 0.3 m.
Let the ball go on the surface of the liquid and use your stopwatch to time how long it takes for the ball to fall from the first mark to the second mark. Suppose it took the ball 6 seconds to fall the distance. Viscosity = (2 x (ball density – liquid density) x g x a^2) ÷ (9 x v), where g = acceleration due to gravity = 9.8 m/s^2 a = radius of ball bearing v = velocity of ball bearing through liquid. Powerblanket makes it easy to lower viscosity of many industrial fluids. 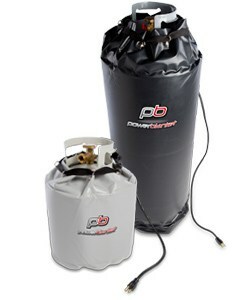 Powerblanket offers various ready-to-ship products, from bucket and drum heaters to ibc tote heaters. We can also produce custom solutions for most applications. If you need better flowing fluids, Powerblanket has you covered. I wake up, rouse my children for school, then check the weather. The weather app on my iphone helps me make a lot of decisions about my day and week ahead–especially what kind of outerwear my kiddos need before they walk out the door. My husband checks out the local forecast online when he gets to work. Some people watch the news while other obsess over what the weather channel has going on. However you get your information, there are numerous methods for coming to similar weather conclusions. Climatology is a simple forecasting method that takes data/statistics collected over an extended period and then averages the results. Meteorologists predict the weather for a specific day and location based on the weather conditions for that same day for several years in the past. A forecaster could examine the averages for Halloween in Utah, for example, to predict the weather for the upcoming Halloween. The climatology method works when weather patterns remain in place, but in situations where outside factors change the weather frequently, the climatology method is not the best choice for predicting the weather, as it will more than likely not be accurate. An analog is a thing seen as comparable to another thing. The Analog Method is a slightly more complicated method because it involves examining today’s forecast scenario and remembering a day in the past when the weather looked very similar (an analog). The forecaster would predict that the weather in this forecast will behave the same as it did in the past. For example, suppose today is very warm, but a cold front is approaching your area. You remember similar weather conditions happening last week, also a warm day with cold front approaching. You also remember how a heavy thunderstorm developed in the afternoon as the cold front pushed through the area. Therefore, using the analog method, a forecaster would predict that this cold front will also produce thunderstorms in the afternoon. The analog method is difficult to use because it is nearly impossible to find a perfect analog. Various weather features rarely align themselves in the same locations they were in the previous time. Even small differences between the current time and the analog can lead to very different results. The argument in favor of analog is that as time passes and more weather data is archived, the chances of finding a “good match” for the current weather situation should improve, and so should analog forecasts. Numerical Weather Prediction (NWP) relies on supercomputers to predict the weather. Massive supercomputers, complete with software forecasting models, help meteorologists make weather predictions based on multiple conditions in the atmosphere such as temperatures, wind speed, high and low pressure systems, rainfall, snowfall and other conditions. Meteorologists review the data to determine the weather forecast for the day. The forecast is only as good as the algorithms used by the computer’s software to predict the weather and the data is overwhelmingly limitless. With advanced calculations and the ability to analyze numerous factors at once, NWP provides the best means of forecast the upcoming meteorological conditions when compared with the other methods. Did your mom ever say, “Red sky at night, sailors delight. Red sky at morn, sailors take warn”? Mine did. Outside of the standard and more advanced methods used by professionals, there are numerous, less-conventional ways to predict the weather. Back before the turn of the last century and before the National Weather Service was in place, many looked to the breastbone of a goose for winter predictions. Around Thanksgiving, a goose would be killed and cooked. The cook would roast it, carve it, and serve it, always being careful not to cut the breastbone from the carcass. After the goose had been eaten, they would carefully remove the breastbone and cut away all the meat and fat left clinging to it. Then they would take the bone and put it on a shelf to dry, keeping an eye out for the coloration that would follow. If the bone turned blue, black, or purple, a cold winter lay ahead. Purple tips were a sure sign of a cold spring. A blue color branching out toward the edge of the bone, meant open weather until New Year’s Day. If the bone was a dark color, or blue all over, the prediction was for a real bad winter. An overall dark color meant that the goose had absorbed a lot of oil, which acted as a natural protection against the cold. The darker the blue coloring, the tougher the winter would be. The Woolly Bear caterpillar has 13 distinct segments of either rusty brown or black. The wider the rusty brown sections (or the more brown segments there are), the milder the coming winter will be. The more black there is, the more severe the winter. In the fall of 1948, Dr. C. H. Curran, curator of insects at the American Museum of Natural History in New York City, took his wife 40 miles north of the city to Bear Mountain State Park to look at woolly bear caterpillars. He collected as many caterpillars as he could in a day, averaged the reddish-brown segments, and then forecasted the coming winter weather through a reporter friend at The New York Herald Tribune. Dr. Curran’s experiment continued for eight more years and attempted to prove scientifically the weather rule of the Wooly Bear Caterpillar. The resulting publicity made the woolly worm the most recognizable caterpillar in North America. While most scientist do not take the wooly bear research seriously, there is a Wooly Worm Festival in Banner Elk, NC every October that celebrates this mini forecaster. After a caterpillar race, the retired mayor inspects the winner and then predicts what the coming winter will be like. Whatever way you slice it, dry it, or count it, Winter 2018 it tiptoeing in. All predictions are pointing to winter coming sooner, with more intensity, and with increased snow. Powerblanket encourages you to take the necessary steps to prepare for the cold ahead. Resin curing + heat. This is something that isn’t discussed too much because, let’s be honest, it’s not a great selling point. The quicker and easier you can get your epoxy to cure the better, right? Resin curing temperature and curing time will vary depending on the mixture and manufacturer. While some systems are designed to ‘cure’ at room temperature, heat must be added for epoxies to reach optimal performance properties. Heat can be added via composite curing ovens, radiant heat, or epoxy curing blankets. Systems that cure at room temperature vs. those that require heat. While some systems are one part, most resin mixtures require two components. In one-part systems, heat is required to “kick-start” and maintain the curing process. More specifically, temperatures must be maintained around 250°F-350°F for a few hours (specific requirements vary). Two part systems require the following elements: resin and a curing agent. Mixing the two initiates the chemical reactions necessary for curing. As we’ve briefly touched on, heat requirements for epoxy curing vary from system to system. Quite often, all that’s required of two-part systems is mixing the resin and curing agent; the epoxy or composite is them able to finish curing at room temperature. However, some systems require additional heat. Again, the specific requirements of each system vary and can be obtained from the manufacturer. It’s important to note that all epoxy mixtures (even those that ‘cure’ at room temperature) will technically not fully cure unless heat is added. Properly adding heat to systems designed to cure at room temperature will always boost the performance of the final product. However, curing at room temperature makes more sense when increased performance isn’t needed. The epoxy is first left to cure at room temperature overnight. This allows the mixture to “gel” before heat is added. When heat is added to early, it can affect the viscosity. Drops in viscosity can cause the mixture to “run” and can lead to uneven texture in the final product. Heat is applied for a few hours. A good rule of thumb is to keep temperatures 50-100°C above the Tg of the epoxy. This “post-cure” boosts the epoxy’s performance without disrupting the texture or consistency. Heat: What Are Your Options? Composite curing ovens are a highly effective option that allow for precise and even temperature control. Additionally, ovens come in a variety of sizes; whatever needs to be cured, there’s an oven that can fit it. However, this option can be expensive to install and cannot be scaled up or down. Additionally, lack of mobility means projects must be transported to ovens for curing. Radiant heaters are a more versatile and mobile option. They are notably less expensive than composite curing ovens and can be scaled up or down depending on the size of the project. Unfortunately, radiant heaters can cause uneven curing which leads to discoloration, bubbles, and brittle patches. Heating blankets provide all the mobility and scalability of radiant heaters with significantly more precise and even temperature control. Unlike ovens, composite curing blankets allow the heat to be brought to the project (vs. transporting the project to a curing oven). This can save significant time and headache. For example, when repairs are done on wind turbine blades, rather than disassembling the turbine and transporting the blade to a curing oven, repairs can be done on the spot. Powerblanket Epoxy Curing Blankets utilize top-of-the-line heating technology to ensure even heat distribution throughout the curing process. Additionally, Powerblanket offers custom options; whatever your curing needs, we can help you develop a solution. You’ll find heavy-hitting distributors like Pipeline Packaging are at the top of Powerblanket’s asset list. When it comes to getting our products to the people who really need them, companies like these are worth recognizing. A frontrunner in commercial and industrial packaging, Pipeline Packaging pushes everything from eye droppers to giant totes. Servicing an enormous range of industries, including HAZMAT, spill containment, health, beauty, food & beverage, paint, automotive, janitorial, pet and veterinarian, Pipeline has newly expanded their product line to Powerblanket heating and cooling solutions. “We’re thrilled to expand our offering to include Powerblanket products,” says Tim Winings, VP of Marketing and Sales at Pipeline. “Our footprint inside the industrial and food markets makes this arrangement exciting for both companies.” Powerblanket affirms the sentiment. Founded in 1988, Pipeline has spread to 8 states and 10 offices, and over $100M in sales. With their people-centric vision they always consider “Customer First.” Servicing countless businesses in the United States, Powerblanket is excited to work in tandem with Pipeline Packaging. With its reputable history, reach, service, and variety, Pipeline Packaging is an invaluable partner for Powerblanket heating solutions to both of our customer bases throughout the country. Wind Damaged Shingles: What’s Really Wrong With My Asphalt Roof? Asphalt shingles are the most used roof covering in the U.S. because of their affordability and versatility. However, there are many issues with asphalt roofing shingles that are misattributed to wind damage (Marshall, 2010). What some would call “wind damaged shingles,” are actually results of poor installation, natural aging and weathering, roofing in cold weather, contaminated glue, and expansion and contraction due to changes in climate. Read on to find what qualifies as wind damage and what doesn’t. If you think you have a wind damaged roof, it could be helpful to know what actual wind damage to shingles look like and how it happens. For a shingle to be wind damaged, an uplift force from the wind has to occur. This causes a pressure dissimilar between the front and back faces of the shingle. The more the shingle lifts off the roof, the more surface area is exposed between the shingle and the roof, leading to a greater uplift force and faster degradation. As wind blows, it will cause inward and outward pressures on the walls and roof of a building. Any force, including wind, will seek the path of least resistance. This means that when wind hits the side of a house it will move up and over the roof to continue flowing. As it passes the ledge it will create a suction force on the face of the roof, similar to what occurs with an aircraft wing. This is understandable since an aircraft is able to fly due to this uplift force; granted, with a smooth metal wing. On a roof, textured shingles begin to lift because of this turbulence and can cause issues over time. If any problems of faulty manufacturing, climate, or installation occur, this is especially true. The highest uplift pressures on a roof are in areas of change, such as along corners, eaves, ridges, and rakes (Marshall, 2010). This means that it is particularly important to add additional anchoring in the areas of the most uplift. We can’t blame all roofing repair on the wind: some problems stem from environmental temperatures. When shingles start lifting in a uniform, diagonal stairway pattern, they are known as “racked.” When they lift in a straight-up line like a zipper, it is known as “zippering” (go figure!). These are usually a result of climatic expanding and contracting. This is self-evident, since wind blows in all directions, and wouldn’t lift shingles in a uniform fashion. In this case, the line where they lift typically follows the way the contractor installed them. If new roof installation happens in extreme conditions of cold or heat it won’t last as long either. Other uniform roof anomalies include cupping and clawing, where shingles curl up around all edges of the tab (cupping), or suction downward on all edges (clawing). These most likely have to do with the uneven absorption of water and not with the wind. Natural Wear On Shingles: How Long Does a Roof Last? One study by the University of Florida revealed that lifted shingles were more likely due to “a systematic failure of the shingle’s sealant strip” than some other external factor (Dixon, 2013). This is because the sealant strip naturally loses adhesion over time. This natural occurrence leaves the shingle partially unsealed and susceptible to the uplift force of wind and rain. Dixon et al. (2014) observed that asphalt shingles typically stay sealed for 4 to 5 years, and then begin to naturally deteriorate. The average manufacturer’s estimate for an asphalt shingle roof lifespan is about 20 years. This number obviously fluctuates depending on location and weather conditions. The study by Dixon et al. (2014) also found that unsealed shingles can occur from poor installation. 70% of roofs studied showed errors including debris in the sealant strip, under-driven nails, and release tape that was accidentally stuck to the sealant strip from packaging mistakes. These roofs all had a distinct pattern in their damage, meaning they didn’t result from wind (Dixon, 2013). Sealant for roofing needs to be handled properly to ensure an optimal seal when installing shingles. Contamination to a shingle’s sealant strip can also happen in industrial areas where exhaust or chemical residues are abundant. This can affect a roof even more than weather conditions (2014). If you’re trying to verify your roofing warranty, it is important to know whether the weather, contractors, or manufacturing are the culprit behind your roofing damage. Don’t let lack of knowledge keep you from having a reliable, economical, and overall good roof! Craig R. Dixon. “The Influence of Unsealing on the Wind Resistance of Asphalt Shingles.” Journal of Wind Engineering and Industrial Aerodynamics. Vol. 130. Elsevier. 2014. pp. 30-40. “Procedure for an Evaluation of Wind Damage to Shingles.” Prugar Consulting, Inc. Accessed October 11, 2018. http://prugarinc.com/shingles/procedure-for-an-evaluation-of-wind-damage-to-shingles/. RCI. “Misconceptions of Wind Damage to Asphalt Composition Shingles.” RCI, Inc. June 07, 2018. Accessed October 09, 2018. http://rci-online.org/misconceptions-wind-damage-asphalt-composition-shingles/. T.P. Marshall, S. Morrison, R. Herzog, and J. Green. “Wind Effects on Asphalt Shingles.” 29th Conference on Hurricanes and Tropical Meteorology. American Meteorological Society. 2010. Hyannis, MA. p. 11. “What Roof Lasts the Longest?” What Roof Lasts the Longest? – Roofing Southwest. Accessed October 12, 2018. http://www.roofingsouthwest.com/blog/what-roof-lasts-the-longest. Out of Draper, Utah, Grip6 is making a name for themselves through revolutionary, minimalist, recyclable belts. After speaking with Founder BJ Minson, it’s clear to see why. Their ingenuity in the manufacturing process and inventive design makes them Powerblanket’s winner for August’s Power Manufacturers Award. Grip6 began as BJ Minson’s desire to get design experience after completing his engineering degree. He started making products for himself, including a belt that shed typical notch and buckle conventions. After giving them as gifts to friends and family, word spread quickly. As a result, he created a kickstarter project and soon had over 10,000 orders. Initially, Grip6 wanted to outsource domestically to US manufacturers, but high prices led Minson to continue producing the belts in-shop. This was even more possible due to his engineering background, which led him to design his own production machines. Swarmed with positive feedback, people began asking, “Where’s your website? I want more.” Minson decided to take things to the next level. Without bulky buckles, pins, prongs, or screws, Grip6 belts redefine minimalism. They use a reinforced, anodized, aluminum buckle and a Nylon 6,6 strap. According to Grip6, “Nylon 6,6 is more rigid [than traditional Nylon 6], has better tensile strength, has superior abrasion resistance, and can withstand higher temperatures before melting.” With an almost indestructible product, Grip6 gives a lifetime guarantee (or “guaran-damn-tee”). Clearly, long-lasting quality is top priority for Grip6, along with style and function. Economically-minded and future oriented, Grip6 feels strongly about local manufacturing. After four years of working with various manufacturers in the US, they were left wanting: from slower delivery, to lower product quality, they determined they could do better. With custom-created manufacturing equipment, they efficiently quadrupled their production using the same number of employees. They created better quality products at a lower cost than anyone else, producing close to what a Chinese company would turn out if they were to outsource. In addition, Chinese import tariffs don’t affect Grip6, giving them an edge on the competition. Powerblanket appreciates Grip6’s process and philosophy as they challenge the status quo. They have taken success into their own hands. Though BJ Minson wouldn’t say so; his humility surrounding the company’s success is heartfelt. 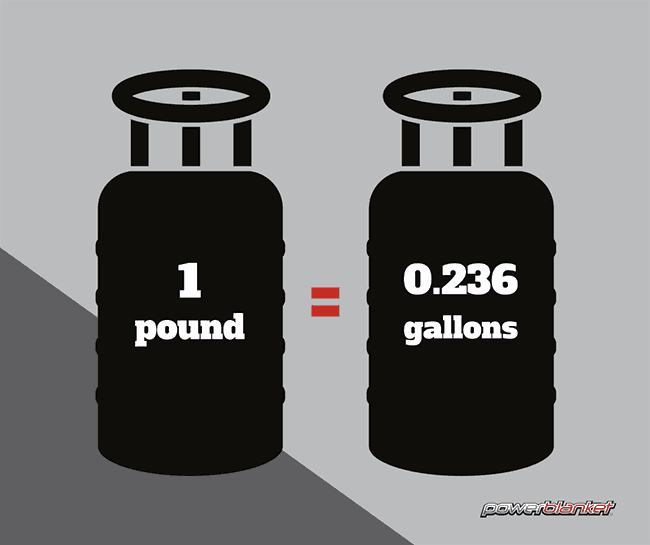 How Many Gallons of Propane in a 100 Pound Propane Tank? It probably goes without saying, but a 100 lb propane tank is designed to hold 100 pounds of propane. Because propane is stored and delivered as a liquid, it can be helpful to know what this looks like in terms of gallons. While there’s a fairly simple answer, there are a few different factors that can affect how many gallons are in a 100 pound propane tank. To put it simply, there are 0.236 gallons per pound of propane (at 60°F). Additional factors don’t add a significant difference to the total volume of 100 pounds of propane, but are interesting to consider. Each gas cylinder will have a water capacity number stamped on the collar (it will be something like WC 240). This is the total mass of liquid, stated in pounds, that a cylinder could hold if filled entirely with water. So our tank can actually hold a maximum of 100.8 lb. As stated above, we know that each pound of propane is 0.236 gallons. Again, this doesn’t make a huge difference, but is still a factor to consider. The examples above assume an ambient temperature of 60°F. At this temp, a “full” tank would produce a reading of about 40% on a tank gauge. When temperatures drop, however, that reading will go down. This is not because there is less usable propane in the tank, the propane has just become more dense or compact and the volume has decreased. The reverse happens as temperatures rise; the tank gauge reading will go up, but it’s still the same weight of propane in the tank– the molecules have just become more spread out. What Happens When Tanks Get Cold? 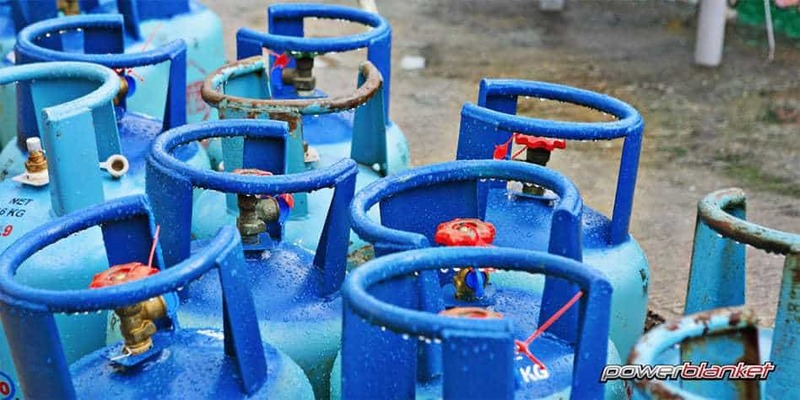 While there is still the same usable amount of propane in a cold tank, the lower pressure can cause tanks to stop working properly. Keeping tank pressure up may require more frequent refills; even when there is still “usable” propane in the tank, the volume is not high enough and additional propane must be added to bring tank pressure back up. How Does a Ground Heater Work? If you participate in projects that require digging or pouring concrete during cold weather, you’ve probably used or considered using ground heaters. Ground heaters can extend working seasons into the winter and make tasks otherwise complicated by low temps a bit easier. 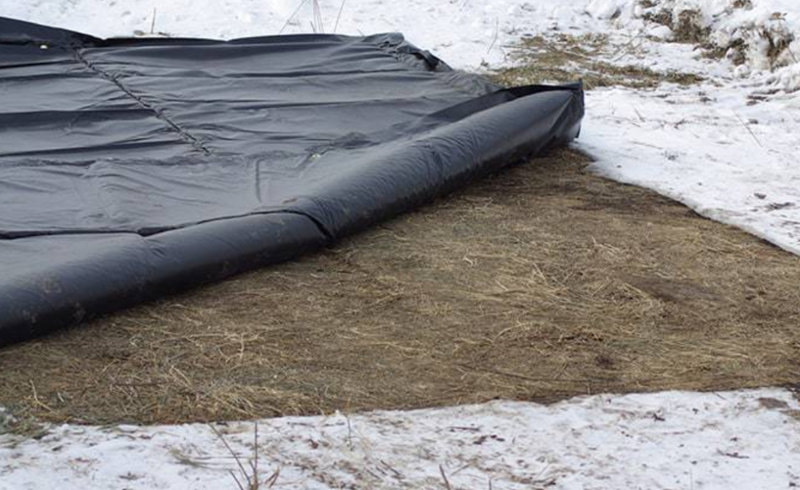 They can be used to thaw frozen ground, cure concrete, and even to warm up surrounding air temperatures. How ground heaters work depends on which type of ground heater you’re using; the most common are hydronic heaters and heated blankets. Hydronic heaters work by heating a propylene glycol mixture and pumping it through long loops of hose that are placed over the area to be heated. Heated blankets work via heating elements that run through the blanket and distribute heat over the surface of the blanket. As mentioned earlier, there are a few good reasons to look into using a ground heater. Even with power tools, digging through frozen ground is unnecessarily time consuming and labor intensive (and without power tools, it’s pretty much impossible). Not to mention, most specifications prevent teams from placing concrete on frozen ground. Without ground heaters, that could mean pushing pause on all concrete projects for months at a time! Using a heater will make digging a (relative) breeze and keep operations running all winter long. Concrete curing involves a chemical reaction that requires fairly specific temperatures. When temperatures aren’t high enough (above 40-50°F), the necessary chemical reactions will slow down and the concrete can essentially stop curing. According to the American Concrete Institute (ACI), when concrete is poured at or below 42°F, there must be heat protection for an adequate cure. Ground heaters can keep concrete at ideal temperatures during the entire curing process and help achieve max cure strength. How do Ground Heaters Work? A boiler heats the propylene glycol mixture (this mixture effectively conducts heat). The heated mixture is pumped through a length of hose that is laid in loops over the area to be heated. A vapor barrier is used to cover the hoses and to keep moisture from escaping. Typically, Insulated blankets are also laid over the vapor barrier. Heated blankets offer all the portability and convenience of hydronic heaters and then some — they take less time to install and remove and, because they take up less space, are easier to transport. Instead of long loops of hose and a propylene glycol mix, heated blankets use electric heating elements that run through the blanket and heat the ground surface. The blanket is spread out over the area to be heated and plugged in. Electricity powers the heating elements that run through the blanket. Heated blankets typically include an insulating top layer that traps heat and keeps the blanket working even more efficiently. Powerblanket provides ground heating blankets including ground thawing blankets and concrete curing blankets. If you’re interested in these heating options, please give us a call at 888.316.6324. We’d be happy to answer any questions!